One of the first things a parent will have to do is realize there is a possibility their child could be using steroids or other illegal drugs and come to grips with how they are going to deal with this. Denial and wishful thinking can quickly lead a family down the path to destruction. A lot of parents seem to have more a friend relationship with their children and when it comes to drugs, parents have to step up to the plate and be a parent and especially a protector. Getting past the hurdle of denial and putting all your strength and energy into identifying the problem and figuring out a way to stop your child from becoming a steroid user should be a top priority. You could potentially save them from making one of the most dangerous or life threatening mistakes they could ever get involved in. The next step is to identify the signs that can prove your child is abusing steroids. One of the most obvious signs of steroid abuse is sudden muscle growth. Unusually fast bulking up (excessive and rapid muscle growth), especially in the shoulders and neck region, and across the chest and biceps often indicates steroid abuse. Another common sign of steroid usage is an unusual and significant break out of acne on the face, or even more common, on the upper back, across the shoulders. Next, look for mood swings or other shifts in behavior outside a teen’s normal behavior, such as a violent or combative attitude. Look for drastic cosmetic changes such as shaving their head or changing their style of dress. Using mouthwash or excessive brushing of their teeth, to cover up a serious sign of using steroids, which is harsh or foul breath could be another subtle sign. Paranoid behavior may become event in daily activities. They may become more secretive and closed off. For example, becoming irritated by an adult’s presence in their room or hiding their internet searches can be an indicator that something is amiss. A huge indicator that parents seem to miss a lot is when their child talks about steroids, asks questions regarding steroids, or even any type of workout supplements. It could be an early indicator that you need to pay more attention to what’s going on in their life. Lastly, watch your child’s social life. See if they are changing friends more often or how they seem to be relating to their friends or family. Don’t hesitate to get involved in your child’s life, but do it in a tactful way without being to pushy to get information. Start by trying to understand the basic needs of your child, their interests and concerns. Every child wants to be accepted and is very susceptible to peer pressure, wanting to look there best and to get noticed, so stay connected and informed about your child. Things haven’t changed that much with respect to social interaction. What has changed is that kids can now get their hands on drugs and with much easier access. Drugs are easily obtainable and steroids are no exception. With internet access now available in almost every home across America, kids are exposed to every easily expose to every market and consumer good on the planet. Having only minimal resources, a kid can discover, research, and even order steroids online within days of having them in hand. In today’s world, steroids are the ultimate esteem builder. They are readily available to teenagers and young adults who are willing to look past all of the side effects they may cause because they will gain a short-term fulfillment. Before this begins, you have to be ready to confront your child and seek the truth before the situation can get out of hand. Adolescents usually have a craving for a role model in their life. They want someone they can admire, look up to, and respect. You, as a parent, can be that person or allow someone else to be, but you need to have a known presence in your child’s life. There are tons of other outside influences our there, and it’s your responsibility as a parent to keep them on track. Physical appearance is a huge influence in our society today. From muscle magazines, to TV and movies, great physique is highly craved, and commonly praised over all over virtues and values. Steroid abuse is on the rise even though people are beginning to see the real truth in the news daily. Promote your child’s self-esteem as early or as often as possible. Encourage a health lifestyle and be an active participant in it. Most importantly, establish a healthy body image for your child by using positive words that ensure confidence and laying down a solid healthy foundation for them to follow. 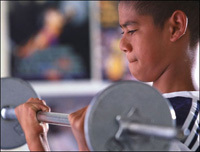 You have determined that your child may be using steroids, so where do you go from here? Keep in mind, there are no easy answers. If you are realistic about the situation and are able to obtain a urine sample from your child, then you should do it. Understand, your trust and communication with your child could be potentially damaged, but this is probably the easiest way to determine the truth. Your child’s safety is at hand so intervention is most important. It is no longer about how much you are a friend to your child or how popular you are, but about your child’s safety. The next step is to talk to your child about the abuse of drugs and the severity. Take them to the doctor to get urine results if you can’t get them yourself. Start by having your doctor discuss case studies involving steroids and teens. By talking openly with your family physician, they will be upfront in telling your teen how badly the drugs could damage their body. The doctor can also give your child possible alternative and healthier suggestions instead of using steroids like proper nutrition and strength training or exercise ideas. The main objective is to not be naïve and address the situation as tactful as possible. The need to overcome perceived shortcomings is very powerful. At first, your child may not hear a word of what you are saying, but keep trying to communicate openly with them. You are as much of an influence on his or her life as any muscle magazine, TV show, or gym trainer. You can be the person that makes the biggest difference in your adolescent’s life. When your child doesn’t make wise decisions about their health, it is your responsibility as a parent to step in and make those decisions for them! Parents, if your concern is less immediate or perhaps you haven’t seen many of these signs above, but you sense something is changing, continue to pay attention! Drop subtle hints to let your child know you have realized something’s up. Start doing your research so that you know what you are saying to your child is factual, because most likely your child has gotten bad or incorrect information. 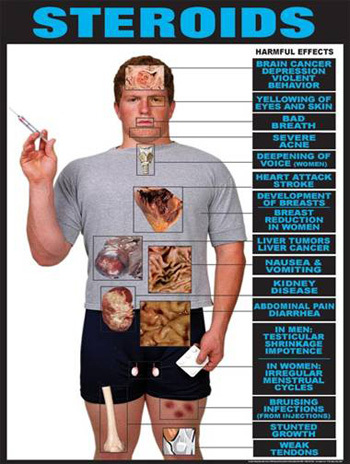 This website has very thorough information covering all aspects of steroid abuse. Then, talk about steroids openly, the good, the bad, and the ugly regarding them. Openly talking about steroids with your child may not solve the problem right away, but at least you are getting the topic out in the open. Remind them that taking steroids is a form of cheating. The guilt factor can be introduced and some kids find it difficult to continue abusing steroids when they’re aware their parents know about it. Don’t assume it will happen like that so continue to watch for the signs. Ultimately, there are no hard or fast solutions to this problem. Continue to educate yourself and your child about these dangers and stay involved and in tune with their lives. The most important way to decrease the chance of your child abusing drugs is to openly communicate with them. Parents can deter many adolescent problems by just being available, helping to raise their self-esteem, and heading off unworthy goals.